The Continuing Education Program at Our Lady of Peace is focused on providing you with opportunities to refresh and deepen your knowledge of Christ and his Church, so that you may come to know Christ more deeply, live your life in Christ more fully, and bear witness to Christ more ardently through example and word. 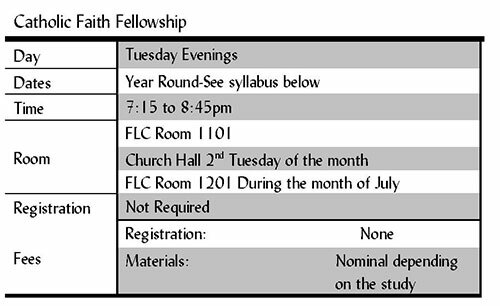 Catholic Faith Fellowship is structured into short topic series on the Catholic Faith. A series can last anywhere from one to eight weeks. The main catechist is Rev. Anthony Hernández.